Today is the fourth day of December which this year is also the fourth day of Advent. Advent is a season of anticipation just before Christmas Day. It begins four Sundays before Christmas and ends **spoiler alert** on Christmas. This means that the length of Advent fluctuates. Sometimes it begins in November (even as early as November 27), and sometimes–like this year–it begins in December (even as late as December 3). Unlike Lent (the season before Easter), which is always 40 days (plus six Sundays) long, Advent can be as long as 29 days and as short as 22 days. There is no biblical mandate for celebrating Advent. It is a tradition that has been developed and introduced by Christians seeking to help one another adore Jesus as Lord (which, by the way, IS mandated by Scripture). Should you celebrate Advent? Well, if you mean should, as in ought, as in is it a rule, then no. But if you mean is it a good thing to do, then yes. In fact, if you are a Christian and you celebrate Christmas in anything close to the American traditional way with gifts and other things I would go so far as to say you really need to celebrate Advent to help you and yours keep perspective on the “holy day” you are celebrating on December 25. Advent means “Coming.” The season of Advent, then, is the anticipation, the looking forward to the day we celebrate God’s coming to earth in meekness and humility as a baby, “born to set his people free.” There are many traditional, and non-traditional ways to celebrate Advent: Scripture readings that focus on various aspects of the story of the birth of the Christ child, or on the many prophecies that anticipated the advent of the Savior; singing traditional Christmas carols and talking about both the meaning of the songs and the stories behind how and when they were written; counting down the days with special calendars that hold special gifts and writings for each day as you anticipate Christmas morning. My brother has built a slightly less than traditional Advent Calendar for me and a few others this year. Some things to keep in mind for Advent that may help you and your family if you decide to celebrate. First, there was no Advent for the first Christmas. No one was anticipating the coming of the Savior with the possible exception of the magi, though they may have learned of his birth after the fact (Matthew 2 tells us they showed up after the birth, and may indicate that they learned that he was born after the fact also). But God’s people were not anticipating with eagerness the coming of their Savior. It had been too long. The prophets had been too quiet. Worship had become rote. Even the high priest doubted the time had come, even after an angel of God told him directly. Have you stopped anticipating God’s advent? Has worship become rote. Does it feel as if God no longer shows up; God doesn’t break through anymore? Have you given up hope not only for Christ’s second coming but even for His coming to heal you today? Advent is for you. Anticipate the deliverance from a long season of darkness and silence. Look forward to the quiet breaking through that the Spirit of God still does for his children. Adore the Christ who came into this dark world to deliver you from your darkness and to be with you as you continue to walk in this dark world. Second, Advent is for Adoring Jesus. It is too easy to let this season devolve into adoration of family or adoration of self or adoration of stuff. Anticipation of Christmas can too easily become anticipation of seeing the delight in our children’s eyes when they see the gifts under the tree, or anticipation of getting all the stuff on our lists, or anticipation of a first sit down family dinner in six months. There is nothing wrong with family meals or giving gifts or even finding joy and delight in God’s provisions and creation. But these are not ultimate and it is important that we remember and help our children remember that. This is is the season for anticipating the celebration of the coming that was not anticipated. This is the season for reminding us to anticipate and expect that Christ still comes to set us free. This is the season to remember to anticipate that Christ will come again. 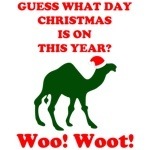 And do you know what day Christmas is this year? Do you? Anyone? Mike, Mike, Mike, Mike, Mike, Mike. That’s right.